I spent most of my life growing up in Southern California, went to college at W.V.U. and attended seminary at Trinity Episcopal School for Ministry. 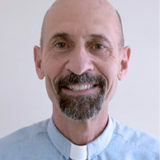 I’ve had the privilege of ministering to many people in numerous places, starting out as Youth Advisor in the Diocese of Pittsburgh, serving as a Navy Chaplain at Pearl Harbor and during operations Desert Shield & Storm, traveling the Country as an Outreach Speaker for Food for the Poor, being Rector of Advent Episcopal Church in Cleveland and coming to St. John’s Naples in August 2008. It’s exciting for me to be here as I celebrate 30 years of ministry in 2014 with the St. John’s family. We are growing spiritually, numerically and in so many ways. A special thanks to my wife Janet, son Joey and daughters Lisa & Lauren for sharing this very special journey with me! I invite you to click on Recent Sermons and In the News to learn more about me. Blessings!